What a hotel this is?! Fast becoming the iconic building of Singapore, the Marina Bay Sands is a luxurious, modern and exciting hotel that draws in thousands of guests and tourists each year. 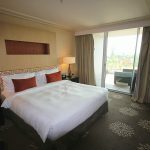 Whilst visiting Singapore, we spent a night in Marina Bay’s Orchard Suite. We were able to find a great deal on the hotel’s website and snapped up a lovely suite overlooking the colourful Gardens by the Bay. On arrival at the hotel, we were escorted to the VIP check-in lounge and admittedly felt like royalty. Once checked in, the receptionist explained the many amenities available to us and asked a porter to show us to our room. 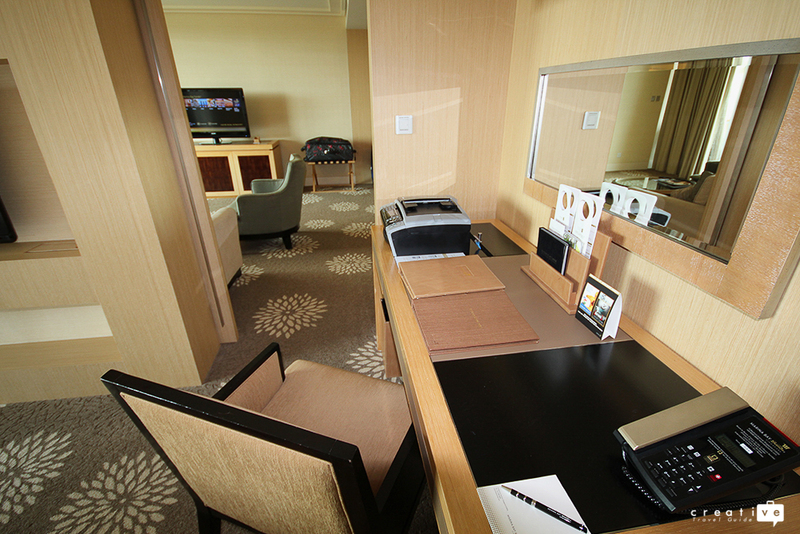 The suite was modern and spacious with some great perks. The bedroom and living room was separate, both with flat screen TV’s and both with incredibly comfy furniture. A fridge and coffee machine is available to use as well as a walk-in wardrobe. The bed was incredibly comfy and the shower powerful and spacious. 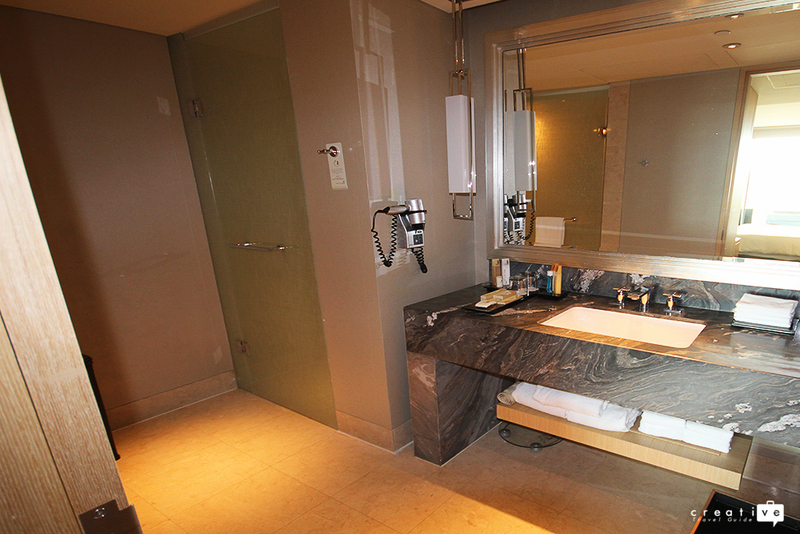 The only thing that let it down was no bath tub, I had presumed there would be one with every suite. 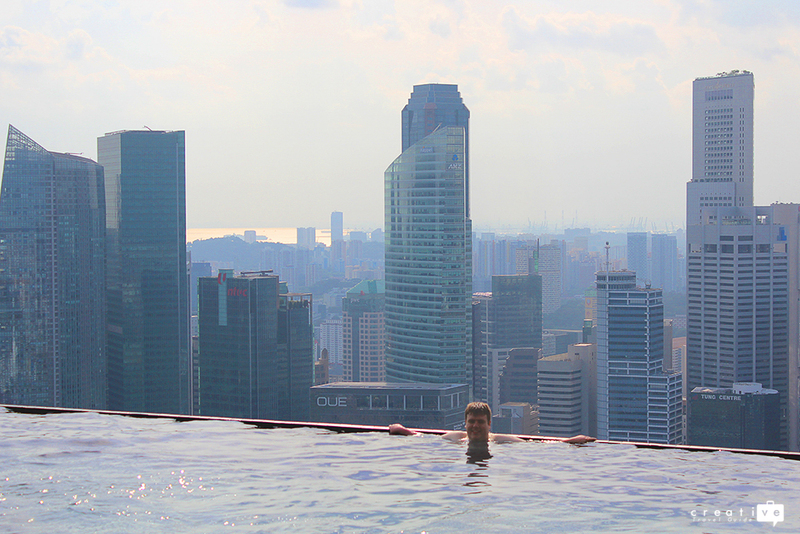 We then headed up to the best feature of the hotel – the infinity swimming pool which overlooks the stunning skyline of Singapore. A flash of our VIP wristbands allowed us entry and very polite staff guided us to the quiet area of the pool. The cost of the room is worth it for this great view whilst you swim. Only guests can swim in the Marina Bay Sands infinity pool. 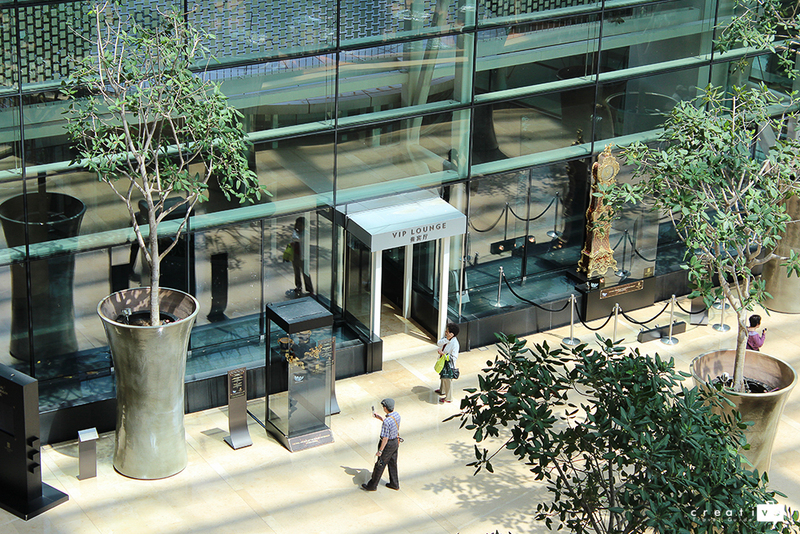 Visits to the observation deck are available for those not staying at the hotel but it just isn’t the same! Marina Bay Sands should definitely be added to a girlie weekend in Singapore – it has an amazing SPA! Included in our stay was a cocktail and canapé hour which provided us with an array of buffet food with canapés inspired from food around the world. The food was delicious and you could return to get more food or cocktails as often as you like. 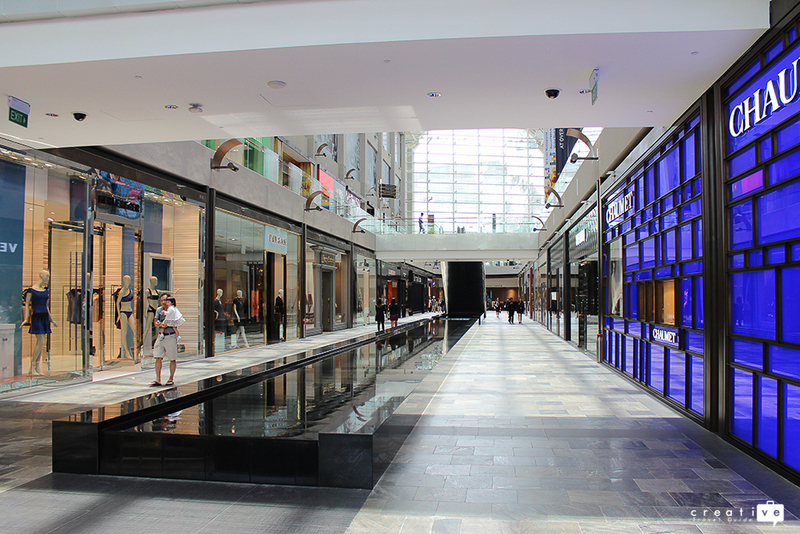 Marina Bay is also connected to a massive shopping centre and casino, perfect for the whole family. 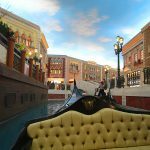 The shopping centre hosts a variety of shops for all budgets and the Casino was great fun, we even came out with a little win. That evening we went through the shopping centre to the front of the hotel, found a spot on the steps and watched the light and water show – ‘Wonder Full’. A 15 minute show of visual effects, electric light and laser effects. Catch the show at 8pm and 9.30pm Sunday – Thursday and 8pm, 9.30pm and 11pm on Friday and Saturdays. You can also watch this light show from across the waterfront near The Fullerton. 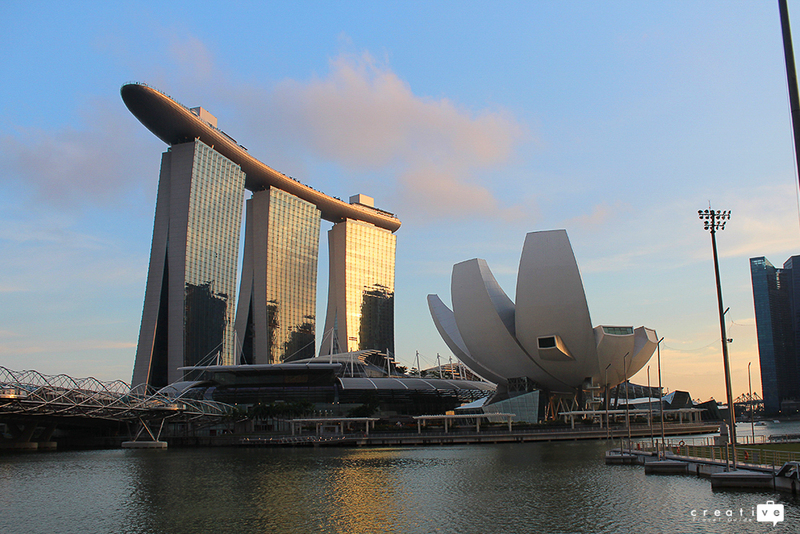 Marina Bay Sands offers one of the best sunset views in Singapore! A Continental breakfast was served the next morning on the top of the hotel, again with a great view of Singapore. 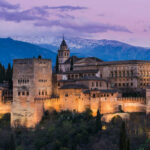 Check out was quick and easy and the staff were excellent and efficient in arranging transport to the airport. Although expensive, a night or two at Marina Bay Sands is well worth the price. 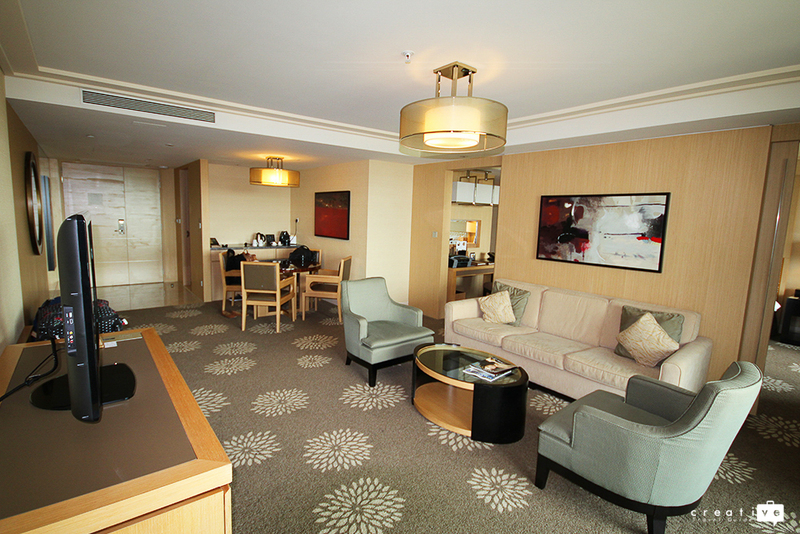 One night in the Orchard Suite was S$611. Note: Marina Bay did not sponsor us to promote or advertise their establishment, we just wanted to share our amazing experience and opinion with our reader. However, if you would like to stay at this hotel, please use our affiliate link and book via Agoda (who offer the best rates for Asia hotels). 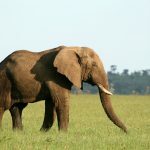 It will not cost you anything extra but we make a small commission to continue blogging and sharing our experiences. This makes me want to immediately go to Singapore and stay here! Oooooo, I’ve always wanted to go here!! I visited Singapore before this hotel was built so I really want to go back and stay at the hotel. I have to swim in that pool too. Sounds like you had an amazing time! OMG! This hotel looks beautiful!!!! The view, the pool…I mean everything! Pure luxury! I would love to stay here when I visit! Thanks for sharing! That infinity pool is so dreamy! Not sure I could shell out $600 for any hotel, though. I briefly visited this property on my last trip through Singapore early last year but did not stay at the hotel. It is absolutely world class and the staff are efficient, friendly and professional. I will need to stay here next time with great access to Gardens by the Bay and the shopping centre – not to mention a short walk across to where the Merlion is. Lovely review and photos. I reckon it’d be worth it too, just so you can say yep, I’ve been there! I was there last year, and the hotel’s structure is amazing inside. I didn’t stay there (too expensive) but I have to disagree when you say the observation deck isn’t the same. Yes, you don’t get a chance to swim, but I was able to get on the deck, take some photos of the magnificent view, and then finish my cocktail in the bar. That, plus when I was there, there were so many people in the pool, it almost spoiled it! Glad you guys had a good time! This looks so luxe. May have to try to sneak into that swimming pool next month! Wow Marina Bay hotel looks soooo incredible! I’d love to go swimming in the infinity pool. I probably wouldn’t be able to afford actually staying there though… maybe some day!! A nice and very fancy hotel to consider when I eventually get to Singapore. The view over the Bay Gardens is a winner for me. Great review. Thanks Danik! 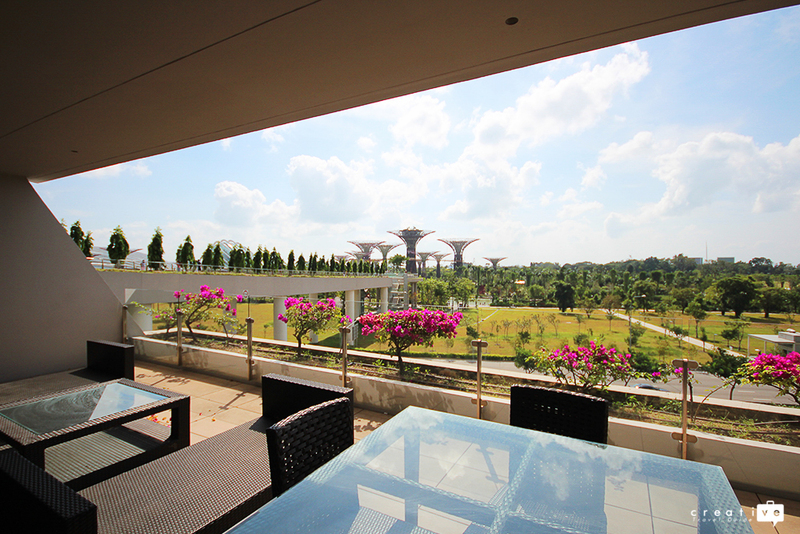 Yeah it is a great choice and so near the Gardens by the Bay too! We only went to Marina Bay Sands to see the stunning views to the rooftop bar, but this is definitely a great hotel to stay in Singapore. Design is amazing too. The pool wasn’t too bad to be honest!! I think maybe it depends on what time of year you visit – we went in March and the whole hotel seemed fairly quiet so pool was lovely! WOW! That infinity pool looks insane! Will definitely keep this on our radar if we’re in Singapore! I’ve been to Singapore few years ago and I’ve been really impressed by the Marina Bay Sand: three 57-floor towers connected at the top at 656 feet by a 3 acres roof terrace known as Sands Sky Park. A totally crazy building !! Yeah keep an eye on the deals on the website! You can get some great deals on the suites, making them similar prices to the standard rooms! It certainly looks like splurging on the suite has great benefits -pool, cocktails, and food. Not sure I’d be able to afford it, but if I could, I’d be swimming in that pool! Yeah was a splurge for a special occasion with lots of great amenities to make up for price! This hotel is literally the hotel of my dreams. Mainly because of the infinity pool haha, but the amenities sound amazing too! That’s quite a steep price, but I’m sure it was well worth it! I can’t get over the views! Yeah the pool is unreal and definitely the reason we booked the hotel originally! Wow that suite looks incredible! The view, the facilities, just lovely, but I must say I’m as surprised as you that it didn’t have a bathtub – I would have though that would have been a given! It’s definitely a once-in-a-lifetime kind of purchase (for me at least) but I still don’t know if I could part with $500+ for just one night! But I would love to experience it! I’d be so torn! Yeah it is Singapore dollars so a little cheaper that $500 USD but still a lot! Worth it for a very special treat and we did splurge! What an incredible suite! And that’s got to be one of the most amazing pools ever! This is perfect because I’m hoping to visit Singapore in the spring! This place looks so nice to stay! Oh have a fantastic time! Woah. Not only is that view AH-MAZ-ING, but that infinity pool is a place I would go and never, ever want to leave. A night there is a little pricey for our budget… BUT it sounds like you were treated so well and had such a great stay (with that amazing food and cocktail buffet, how could you not?) that we’ll put this on our list of places to go for special occasions. 🙂 Thanks for sharing with us! Yeah it is a pricey option but was great as a special treat! Definitely worth it at one point in your life! Marina Bay Sands hotel is an iconic building of Singapore. The luxury and amenities offered by it is wonderful. Swimming in the pool overlooking the whole city is really wonderful. It is good to know that canape n cocktail wete included in your stay. It looks like a beautiful place…the view from that rooftop infinity pool is amazing! What a beautiful hotel! Always love a good infinity pool, too! I’m so jealous I haven’t stayed from this hotel yet, it looks so luxurious. I miss singapore. Reading this review has brought back such great memories from our stay at Marina Bay Sands. 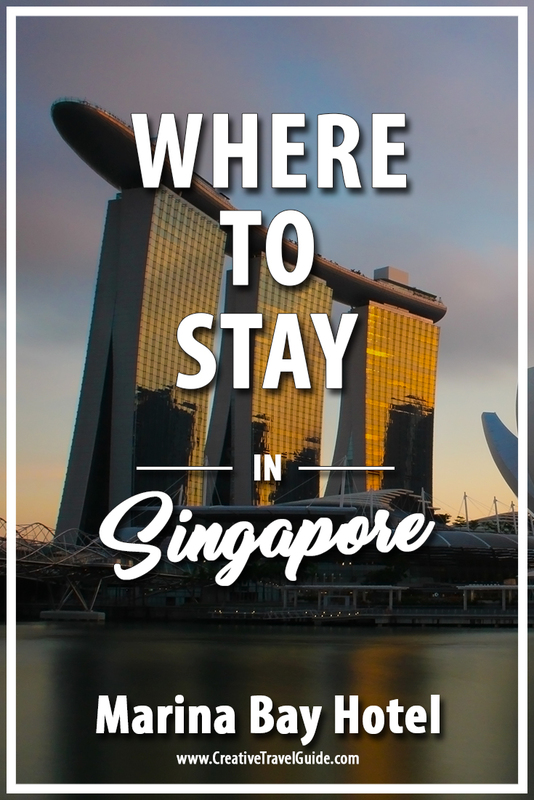 We were in Singapore for 5 nights and stayed at the hotel only for 1 (because it was expensive!) and the main reason was the infinity pool. I couldn’t have missed that and its open only for hotel guests. It was totally worth it and I loved the bar as well as club on the rooftop as well. The service was immaculate and the rooms fantastic, we had a view of the Gardens by the Bay and I couldn’t get enough of it!